The 2018 Volkswagen Tiguan is a truly impressive SUV, and it more than holds its own when compared with competitors like the 2018 Toyota C-HR. We're proud to carry the 2018 VW Tiguan here at Carter Volkswagen; after reading through this comparison, check out our extensive inventory and our regularly updated new VW special offers to find the 2018 Tiguan that's perfect for you. When you're ready for a test drive, give us a call or stop by 5202 Leary Avenue Northwest, Seattle, WA 98107. When it comes to design cues, the 2018 Volkswagen Tiguan and the 2018 Toyota C-HR are very different--and this is evident from the first glance. While the 2018 VW Tiguan has a clean, classy European design, the 2018 Toyota C-HR is stretched and squashed in a way that makes it stand out, but not in a sophisticated or elegant way. The 2018 Tiguan also gives you standard features like roof rails, which are only available as a more expensive upgrade on the 2018 C-HR. Perhaps most telling of all is the commitment to quality that Volkswagen exhibits. The 2018 VW Tiguan comes with a bumper-to-bumper warranty that lasts either 72 months or 72,000 miles (whichever comes first), while the 2018 Toyota C-HR has a bumper-to-bumper warranty of only 36 months or 36,000 miles. Looking at performance, it would make sense to assume that the 2018 VW Tiguan and the 2018 Toyota C-HR are similar; after all, they both have 2.0-liter engines. However, the 2.0L TSI® turbocharged engine on the 2018 Tiguan is much more powerful, putting out 184 horsepower and 221 pound-feet of torque! The 2018 C-HR, on the other hand, only generates 144 horsepower and 139 pound-feet of torque. You'll also find that Volkswagen truly stands behind their high-quality German engineering, with a powertrain warranty for the 2018 VW Tiguan that lasts for either 72 months or 72,000 miles. 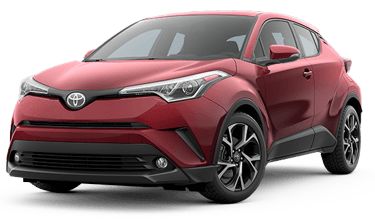 The 2018 Toyota C-HR, on the other hand, has a powertrain warranty that last for 60 months or 60,000 miles. When it comes to safety, you'll find that both the 2018 Volkswagen Tiguan and the 2018 Toyota C-HR are impressive vehicles. With its high-quality safety cage, the 2018 VW Tiguan is designed to protect you and your passengers; meanwhile, the Intelligent Crash Response System (ICRS) can turn off the fuel pump, unlock the doors, and activate the hazard lights if you're in a collision where the airbags are deployed. These are just a couple advantages that come with the German engineering and there's so much more that makes the 2018 Volkswagen Tiguan stand out--come find out more at Carter Volkswagen!